Obviously the last thing that a company like Barnes & Noble wants to do is inadvertently promote their competition by including the name Kindle in eBooks that are converted from Amazon’s platform for distribution to the Nook. One of the most hilarious stories in eReading news to crop up recently indicates that they may be entirely too much against it. 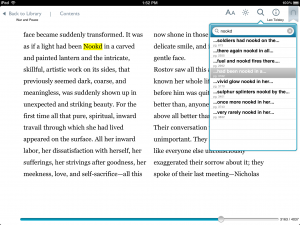 I can understand not wanting to have Kindle ads in Nook books, but editing out the word “kindle” from Tolstoy is a bit weird. Basically the situation appears to be the result of either a prank or shoddy quality control. A blogger names Philip noticed the line “It was as if a light had been Nookd in a carved and painted lantern….” and came to the conclusion that something not quite right was going on in his $0.99 copy of War & Peace for the Nook. Further inspection revealed that every instance of the word “kindle” had been replaced, introducing large numbers of strange phrasings throughout the novel. After he reported it on his blog, the entire internet started lighting up with commentary. Noble. Superior Formatting Publishing, a company that primarily takes public domain titles and cleans them up to releases them on the Kindle, was the one that made the mistake. Basically they clean up line formatting, set proper chapter breaks, create a table of contents, and do all the little things that make it potentially worth paying a dollar for something you know you can always get off of Project Gutenberg for free. Apparently branching out to the Nook was an afterthought, or at least not regarded as particularly important, given that this slipped through. Is it any surprise that a Find/Replace problem occurs from time to time in situations like this? I would say not particularly. So long as the company issues a refund and fixes their titles they are probably fine, and even that is between them and their customers. This event has, however, brought out a crowd that is harping on the easily changed nature of eBooks as a sign that they are flawed. I find that to be shortsighted. It is true that there are potential downsides to eBooks, and that Amazon created part of the mistrust through their handling of the Orwell eBooks debacle in the early days of the Kindle platform. The idea that this sort of word swapping, introduced after the book was well out of authorial control, is unique to eBooks is absurd. It is easier to cause, of course, but it is also easier to fix. I have a copy of Middlemarch sitting on a shelf that holds hundreds of notes made before I got to the last 10% and found that the text had been replaced by 30 or so pages drawn from the middle of a book by another author that I have not been able to place to this day. There was no fixing it, the publisher apologized but made no effort to fix the problem, and generally I just found myself out of luck. At least with the Kindle they could have corrected their mistake with little time and effort or, barring that, I could have fixed the problem myself with a bit of effort and some eBook editing resources from the internet. 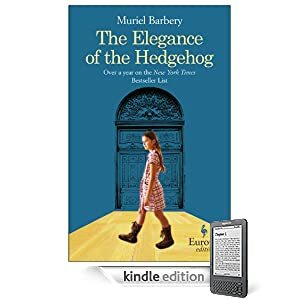 As I was reading Muriel Barbery’s The Elegance of the Hedgehog (which I quite enjoyed, by the way), I could not help myself but notice that the author emblematizes intelligence and erudition in one particular author, Leo Tolstoy. I found it a little amusing and curious – in order to demonstrate the concierge’s intellectuality, Barbery keeps mentioning Tolstoy as her favorite author. The hilarious part, of course, is that she names her cat Leo and that is supposedly what highly intelligent people do. Tolstoy, in fact, becomes the reason why the concierge befriends one of the wealthy and highly educated residents, Mr. Ozu. He is also a fan of Tolstoy, and also gives his cats Tolstoy-related names – Kitty and Levin, from Anna Karenina (which by the way, is free in Kindle edition). And do not question his intelligence! Of course, he is a bookworm – he read Tolstoy! It is not the first time, when I see Tolstoy’s name being dropped here and there as a symbol of individual’s high education. I do not want to dwell upon the thought, whether I agree or disagree with such choice of symbol for erudition. However, Tolstoy’s novels do look intimidating just by looking at the size of the paperback, and even worse – hardcover books. 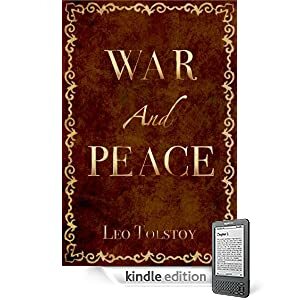 I remember, when I was reading War and Peace, I think, I developed an unusual group of muscles – right around my wrists, just by holding the heavy tome of War and Peace. Also, snuggling with such book in bed is not as comfortable due to the weight of the volumes. And I’m not even going to begin discussing the pains of carrying such book around and reading it in public transportation or in the office, while you wait for the appointment. I mean, it’s not only that you look hilarious behind a gigantic book – almost like Harry Potter behind an encyclopedia of magic spells. It’s just simply impossible to carry such enormous weight around. The beauty with Kindle is the readily available collections of Tolstoy’s novels for sale. And, also one would not feel intimidated by the ginormous size of Tolstoy’s books. If you considered reading Tolstoy, went to the bookstore, flipped through the pages and ran away scared of the amount of pages, then seriously consider giving Tolstoy another chance – try reading his works in Kindle. Yes, you can still see how many pages there are. However, the beauty with e-books is that they conceal the intimidating part – the physicality of big volumes. You start reading, get into the plot, and you would not even notice until you are through with the novel. War and Peace around is priceless.